Coconut Milk Creme Brulee – Easy, Spot-On and Dairy Free! This recipe is from 2011, and it’s still one of the most popular ones on this site. 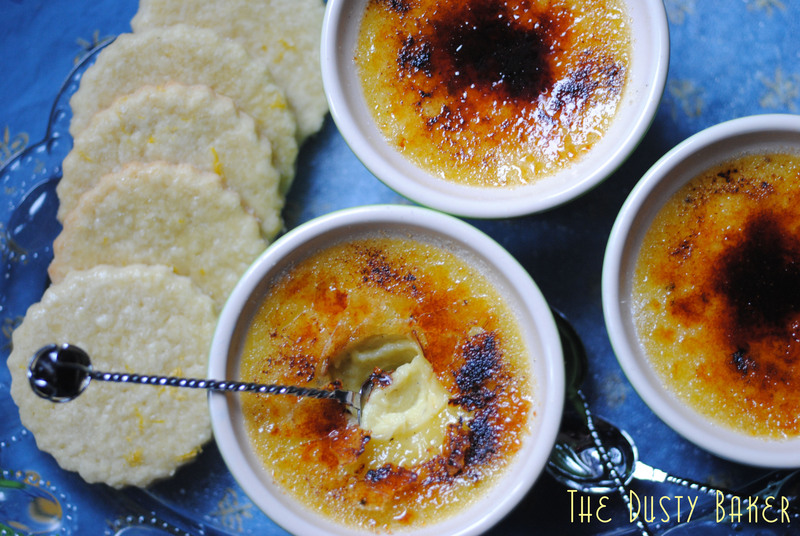 It produces a quick, thick creme brulee that’s great for beginners. Want something a touch above? Try my updated version with Chef Joe Murphy as part of my Pro Pastry, Gluten (and dairy!) Free series. And for the adorable original text, scroll below the recipe. This recipe made FoodBuzz’s Top 9 on December 29th! Thanks for all the buzzing love! Preheat oven to 300° F. Set a pot or kettle full of water on to boil. In a medium bowl whisk eggs, egg yolk, sugar and vanilla until creamy and smooth. Add coconut milk and blend until smooth. Place in ceramic baking dish and pour hot water until it comes halfway up the ramekins. Bake for about 40 minutes, until just slightly jiggly in the middle. Cool until ready to serve or chill until cold. When ready, sprinkle with about 2 tsp white sugar and torch until crispy and brown. Notes: It’s a bit dense. I based the recipe on one that used lemon to cut the thickness. But unlike some other dairy-free creme brulee recipes you won’t have to worry about it not setting. While I was totally pleased with this turnout, you could probably omit one yolk and still find success. Life is delicious. After a packed weekend of family and amazing food and lit fires and lots of hugging, I sat back at a desk Monday morning, worked the day away, then packed Mitra and my Christmas loot into my little blue Subaru and booked it back to NYC. Because I had a guest coming over. A man. Who was cooking me dinner. I’m not the easiest person to cook for, having this whole gluten and dairy free diet thing. My last two boyfriends were great eaters and practically non-existent cooks (Ruark, three bf’s ago, makes a meat sauce to die for). Being domestically bent, I easily fall into the role of kitchen wizard (so a friend once called me) in relationships. I now have a “no cooking for you before the 4th date rule” (a loose rule, but there nonetheless). So a guy offering to come to my place to cook on our second date… was a first. While I made some fancy cocktails (ginger ale, fresh sweet lime and zested ginger with bourbon for me and vodka for him), date man made us an incredible dinner. Flavorful, tasty, relaxed, and much appreciated. I made dessert. A dairy-free creme brulee with loads of vanilla and a perfectly torched crust. We didn’t end up eating it. Cocktails with neighbors led to a late evening and full bellies. So tonight my under-slept self enjoyed the crap outta it while watching Mad Men (and said horrible/adorable Christmas movie) and cuddling the dog. Neighbors upstairs got the rest. It’s dense and just sweet enough, with the perfect little crunch. Using vanilla bean gives it an incredible punch. I’ve so missed creme brulee, and now I’m satiated. Let me know if you make it, who you share it with, how you adapt it, and what you think. Cheers to second dates, Christmases full of goodness, Mad Men, and little dogs. The last time I made gluten free crepes, the man I was dating at the time said “I love you” for the first time. Like, he was in love with me. It was a very special moment. He said it not because we were eating the crepes. Not because they reached out to his French Canadian homeland. But because, in my excitement, I called him over to his stove to show him that they worked! I had made gluten free crepes! Seeing my giddiness he blurted it out, seemed shocked with himself, gave me a hug and returned to the couch. Two minutes later, he came over and said it again while looking into my eyes. Then I said it back. It’s incredible how a recipe can bring back some crazy strong memories. Though we’re no longer dating, I wish him the best, and cherish the moments like that, when he was so supportive and enthusiastic about who I am and what I love. Now, I’m not suggesting that these crepes are going to always inspire such reactions. But the satisfaction of mastering a simple but elegant dish is infectious, and the joy of sitting down to brunch with someone you love and some good friends with a healthful, tasty meal is universally delightful, no? I played with the flours a few more times before coming up with this one, which I’m particularly thrilled with. 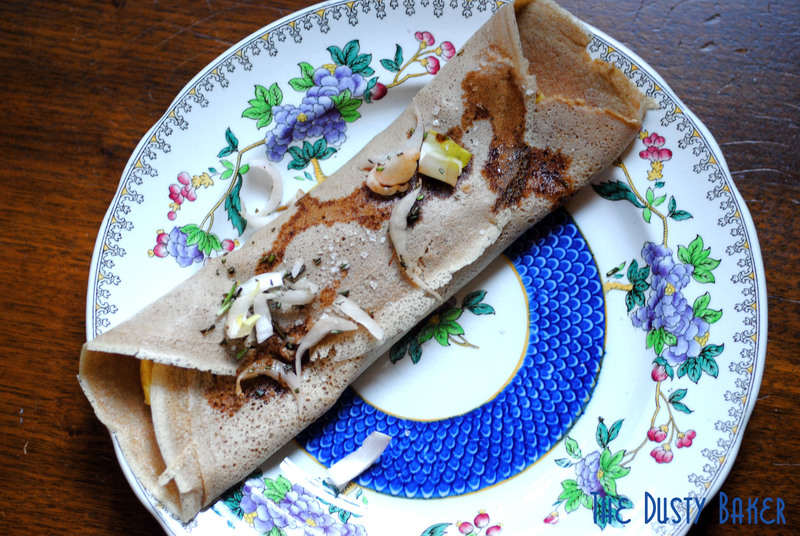 It’s perfect for a savory breakfast or dinner crepe, and has the delightful chew of a traditional French crepe while keeping light and flexible. You can make them ahead of time (as I did with the filling for my breakfast today), or fill as you go and serve to a large crowd. Teff flour is not one many are familiar with, but a gluten free powerhouse I highly recommend keeping on hand in the kitchen. The grain is incredibly fine, and higher in protein and fiber than many other flours. Because an incredible amount of the grain can be grown in a small space, it’s been fundamental in staving off famine in the countries of its origin. It has a very slightly bitter taste to it, so I use it in savory recipes or those that call for strong flavors like molasses, chocolate or cinnamon. I wouldn’t recommend using it as a main flour, but more as an accent (1/4 of a cup or so per cup of flour in a recipe). In the crepes, it worked phenomenally. 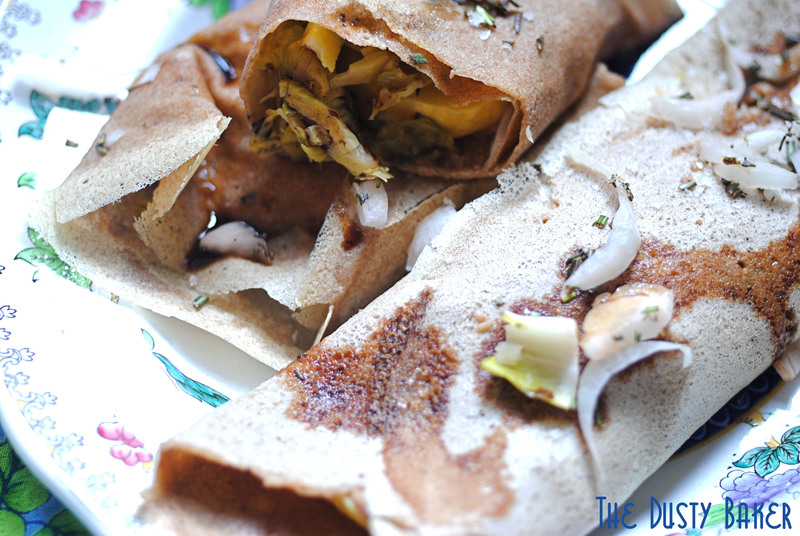 They cooked smoothly and evenly, were strong enough to wrap without being at all tough, and gave some incredibly earthy flavor to the lighter veggies I filled them with. After mastering a few steps, this entire process is incredibly easy. If making crepes for a sweet filling, add 1 tsp vanilla extract and 2 Tbsp sugar to the final step. In a blender, spin the eggs on low for about 30 seconds. With the blending running continually, add milk, then stream in melted butter. Stop the blender and add flour and salt. Blend on high for about 1 minute so that the flours fully incorporate. Pour into a 2-cup Pyrex liquid measuring cup or small pitcher. If possible, let sit for 1-2 hours. This helps the flour dissolve fully and brings all the ingredients to room temperature. When ready to cook, have large skillet with an 8″ base, cooking spray, a small spatula for loosening the edges (I used a small icing spatula), a large turner and a large plate at the ready. Place the skillet on medium/low heat. When hot, spray lightly with cooking spray. With one hand, hold the skillet completely off the heat. While swirling the pan, pour about 3 Tbsp of batter on. Continue swirling until it covers the base of the pan evenly (this takes some practice). You want the crepe as thin as possible, but shouldn’t be able to see through to the base of the pan. Cook until the edges just start to bubble and dry slightly. Then use the small spatula to loosen the edges. Until you get the hang of it, use the turner to flip the crepe. I often just loosen the edges and then flip with my fingers. Cook for about 30 seconds on the other side, until the crepe has lightened in color slightly but is by no means dry. Remove to large plate. Continue with remaining batter until you have 8 full cooked crepes. Tips: Play with your heat levels. 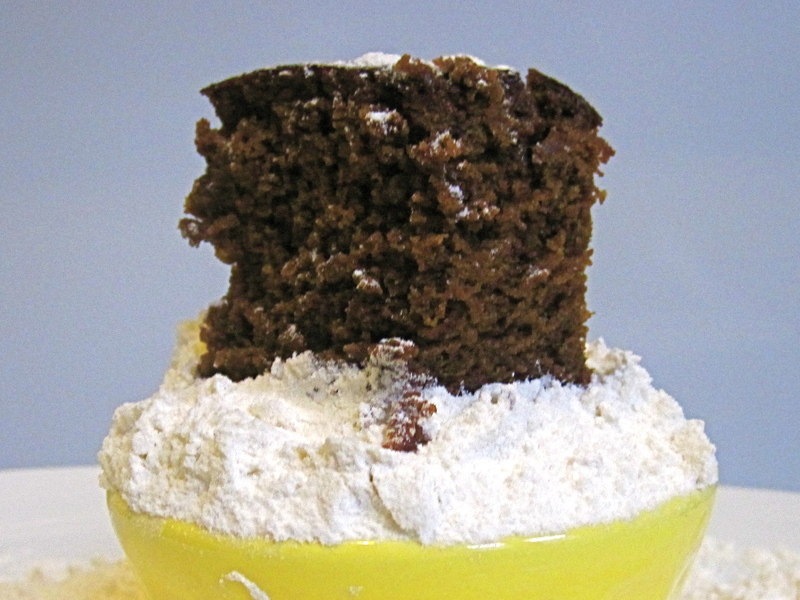 I find medium-low works best so that the batter doesn’t cook too quickly when I pour it on. This way I can swirl until it’s evenly coated. Also, don’t overcook the crepe: it will make the edges brittle and the body of the crepe too hard to fold. Some use butter to grease the pan: I find it sometimes creates too much steam and liquid, so I prefer cooking spray. I filled these with thinly sliced zucchini that had been sauteed in onions, garlic and lots of fresh rosemary, Brussels sprouts roasted with olive oil and Herbes de Provence, and raw, thinly sliced endives. I then drizzled them with a very strong balsamic, sprinkled with fleur de sel and topped with some more endive, rosemary and a blot of goat yogurt. I don’t often blog savory cooking recipes because I usually don’t cook with recipes, unless there’s a technique or specific dish I’m trying to make perfect. But I will say that this combination worked splendidly because of the contrast in textures, flavors and temperatures. Crepes are so versatile: fill em’ up! Chocolate Almond Biscotti – A Recipe Swap! It’s Burwell General Store Recipe Swap time again! And a holiday swap at that! Quick catch-up for newcomers: About 13 months ago Christianna over at Burwell General Store started a recipe swap with Lindsay of Rosemarried, where she gives a recipe to a group of bloggers and we all change at least 3 things about the recipe. 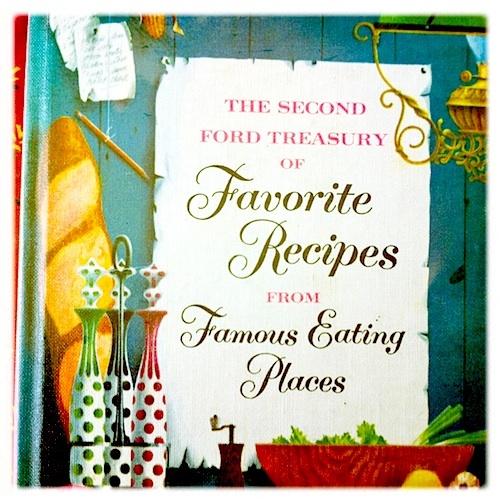 With the coming of the second year we’re now a group of about 25 bloggers and just changed over to our second book, “The Second Ford Treasury of Favorite Recipes from Famous Eating Places”. While I’ve cherished “All Day Singin and Dinner on the Ground”, there’s something momentous about changing books. The swap has been one of my favorite discoveries since starting this blog, and I look forward every month to seeing what the group has come up with, as well as connecting regularly on what’s inspiring us in and out of the kitchen. 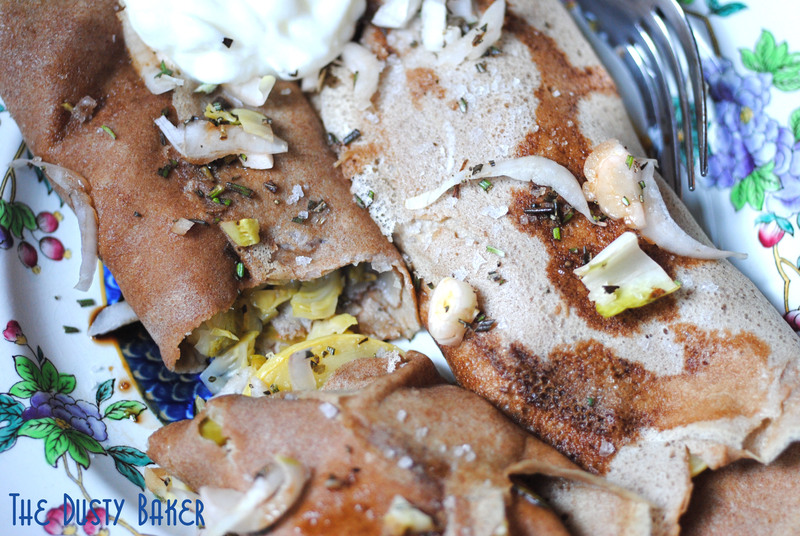 Check out their posts on the little frog link below, and my Recipe Swap category for more! 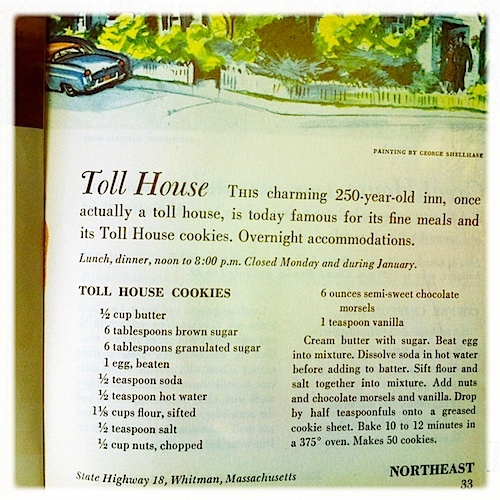 This month, with the craziness of the holidays, Christianna gave us something classic: the Toll House Cookie. I got all mushy and sentimental when I saw the recipe. Because for as long as my little dusty heart can remember my mother has kept her recipes, in bits and pieces, in a Toll House recipe book. Its plastic brown cover contains so many recipes that we played with over the years, and many that are still favorites in our family. Before the internet food world, before this blog, before I knew of single-origin chocolates, the science of baking gluten free, and became what some people might call a “food snob”, there was that book. December's recipe: look at the adorable bit of history! 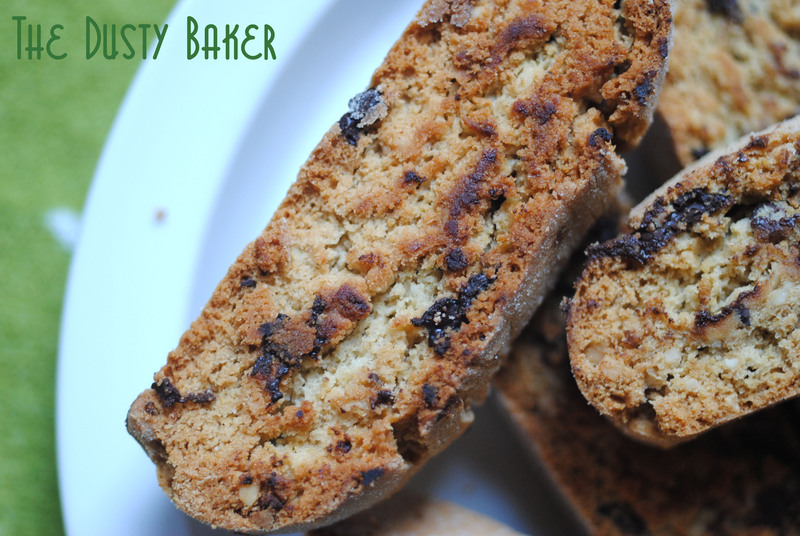 One of my favorites as a youngster was my momma’s biscotti. Crisp and full of mini chips, she made several variations for her abundant plate of holiday cookies. As I had to gluten free myself, she started adapting some of the recipes. Or, at least, she tried. 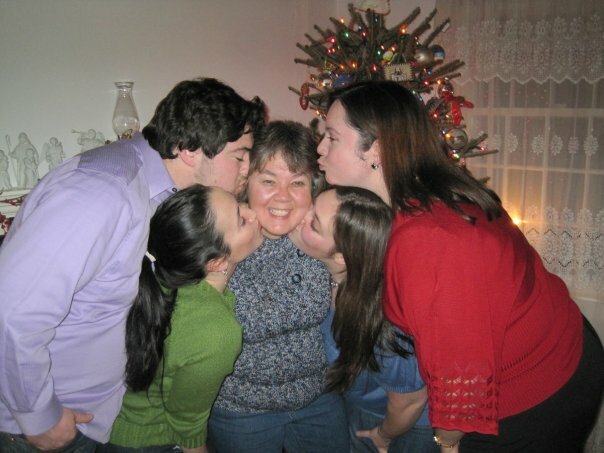 It was sort of a running joke for a while between my siblings and I that she would attempt to make foods that I could eat, and then upon running down a list of ingredients she’d slap her head and go, “ah, sh*t!”. Including the first time or two she made me “gluten and dairy free” biscotti; then realized she used regular chocolate chips. But, as I did, she practiced and learned. And now hers is one of the few houses I can go to and know I will eat, and I will eat well. 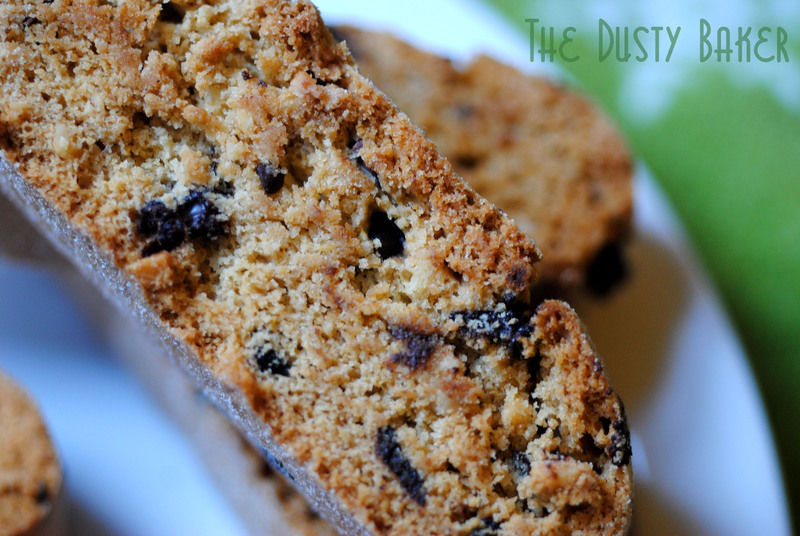 So I wanted to take this classic Toll House Cookie recipe and make it into a biscotti. 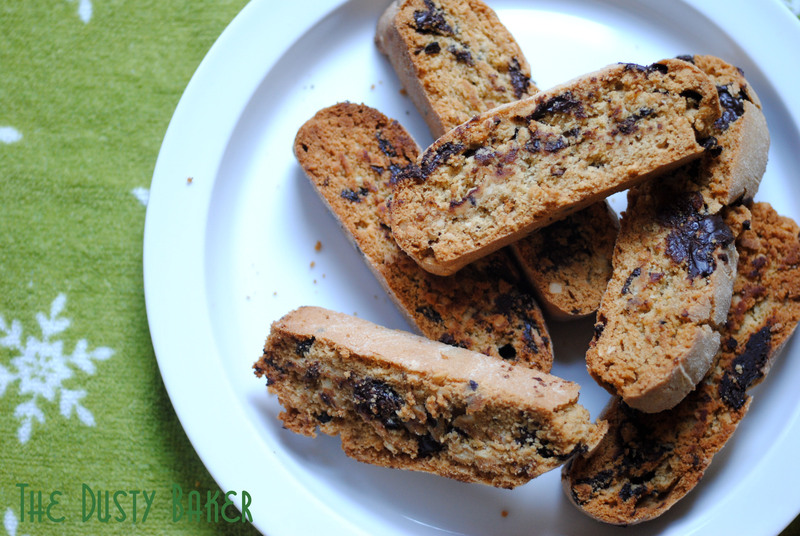 And while no other biscotti will ever give me the same satisfaction as one made by my mom, these are pretty perfect. Crispy, flavored with almond, perfect for dunking in sweet wine (an Italian recently told me that’s the way to do it), coffee or a glass of chilled almond milk (or cow, for you lucky dairy people!). Happy Holidays, Swappers. And, thanks, mom. I love ya more than my luggage (10 cookies if you name that movie). 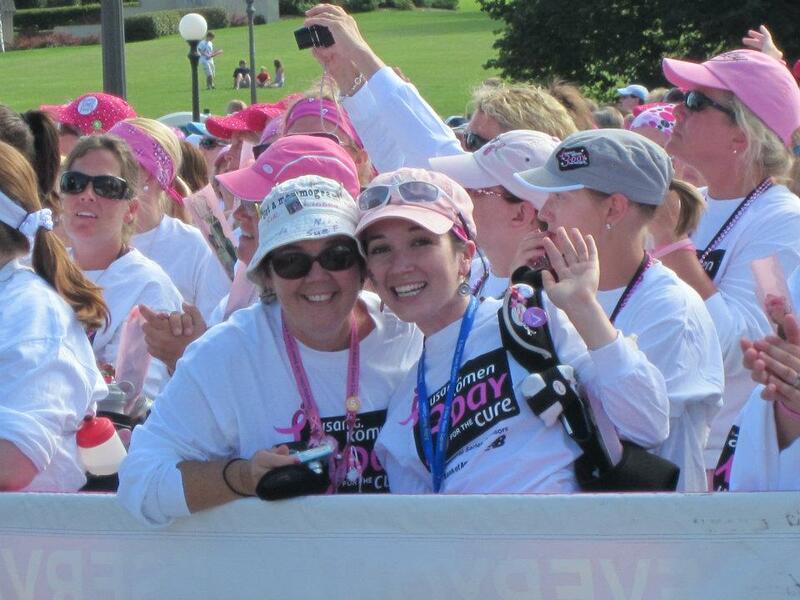 Mom and me at the end of the Twin Cities Susan G. Komen 3-Day for the Cure! Oh, and mom, if you read this… Christmas is coming… hint hint. And yours, please, not mine. Makes 18, Adapted from the Toll House Cookie and Toll House Biscotti recipes, with some dusty love. Notes: I grew up with denser, harder biscotti, so to replicate that I baked the roll until it was slightly underdone, then cut and toasted it. If you want yours crispier and a bit drier, bake completely before toasting. I’ve made this recipe both ways with success. Also, you can swap so many things in and out of this recipes: try cranberries, dried fruits, other nuts, go wild! Preheat oven to 325°. Line a baking sheet with parchment or Silpat, or lightly grease. In a medium bowl combine flours, gum, baking soda, baking powder and salt. Set aside. In the bowl of a mixer with the whisk attachment, beat butter and sugars until light and fluffy, about 3 minutes, scraping down the bowl occasionally. Add eggs one at a time, beat to incorporate. Beat in vanilla and almond extracts. With the mixer on slow, add flour and beat to combine, increasing speed to incorporate. Mix in nuts and chocolate chips. With floured hands, roll into a 12-inch log and place on prepared sheet (or longer if you want smaller cookies). Round top slightly. Bake for 35-40 minutes, or until cracked on top and slightly firm. It shouldn’t be cooked completely, so the center should seem a tad underdone. Remove to cooling rack and cool for at least 10 minutes. Slice into into 1/2 inch slices and gently slide onto cookie sheet, cut side down. They will be a bit crumbly, so use a spatula to gently flip them on the sheet. Bake for another 15-20 minutes or until crisp and brown. Cool completely before serving. Enjoy with or give to someone you love!